Grundtvig Workshop “ALPHABET OF VOLUNTEERING” on the development of tailored volunteer programs for literacy education, capacitating volunteers working with illiterate beneficiaries and promotion of literacy through volunteering programs with the aim of building the competencies of various practitioners involved in adult education, in order to enable them to develop tailored volunteering programs aimed at reducing illiteracy rates in communities across Europe. According to European documents, literacy (basic reading and writing) is more essential than ever before, people need all sorts of competencies related to writing, reading, and correctly interpreting messages. In societies dominated by the written word, it is a fundamental requirement for citizens of all ages in modern Europe. Literacy empowers the people to develop capacities of reflection, critique and empathy, leading to a sense of self-efficacy, identity and full participation in society, as individuals, professionals, no matter the role they take. Literacy skills are believed to be crucial to parenting, finding and keeping a job, participating as a citizen, being an active consumer, managing one’s health and taking advantage of digital developments, both socially and at work. This workshop recognises learning as the most effective when people have an opportunity to learn things that relate to their lives and their needs. 10 practitioners (adults 18+) involved in adult literacy programs (teachers for adults, project managers, social workers, tutors, mentors, volunteer coordinators, persons interested in the topic etc.) from countries of the Grundtvig program, other than Romania. WHAT will you KNOW and BE ABLE to DO after the workshop? Understand the profile of the illiterate adult learner – including cultural and socio-economic differences – and the specific learning needs of this target group. Develop competencies to initiate, design and extend volunteering programs in the field of literacy, and thereby increase the capacity of adult education organizations. Develop specific competencies in the management of volunteers involved in literacy-related volunteering programs. Improve pedagogical approaches in working with illiterate beneficiaries, by developing a holistic approach to illiteracy and enhancing their soft skills like empathy, assertivity, active listening, feedback, etc., relevant in working with the target group. Stimulate proactive attitudes towards diversity, interculturality and their own communities. Share ideas, knowledge and know-how in the field of illiteracy programs and literacy promotion techniques, and understand similarities and differences in volunteering programs involving illiterate adults as beneficiaries in different European communities. Develop a sense of common responsibility for the common illiteracy phenomenon in Europe and facilitate networking on this topic. Expand your services and outreach through the development of tailored volunteering programs for literacy projects. Develop innovative ideas and collaborative projects that could advance the field of literacy programs through volunteer-involvement. Because this workshop proposes a structured way of learning for practitioners in adult education programs that can make a change by involving volunteers in tailored volunteering programs for the benefit of illiterate people. By using specific exercises and reproducing easily activities for daily life, practitioners will be taught to recreate a recognizable environment and to apply the learning-by-doing principle, to involve volunteers in reading and writing activities for people with literacy difficulties. During the workshop learners will have the chance to experiment new methods for developing activities for volunteers working in literacy educational projects, and they will be encouraged to propose methods themselves. The methods can be used further on in their activities with their target groups. The workshop is based on both pedagogical and experiential learning – during the learning process participants will actively work on and analyse their learning progress and the group dynamic through evaluation sessions. Working methods used to achieve the learning objectives include ice breakers and energizers; team building exercises; tasks stimulating creativity; debates; role plays and simulating exercises; work in pairs; group work; brainstorming and facilitated discussion; informal and structured discussions; movies; professional exchange (visits to local NGOs, and sharing ideas in the working group); individual and group presentations; self-reflection and group reflection and more. 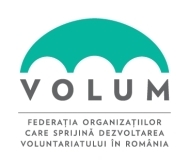 Pro Vobis National Resource Centre for Volunteerism is the leading organization in promoting and developing volunteerism in Romania with over 20 years of experience. Pro Vobis has extensive training experience in both national and international environment, has helped setting up several local volunteer centers in Romania, has developed a wide range of tools and methodologies for volunteer involving organizations and is committed to further develop volunteerism in all its diversity in order for volunteerism to reach its full potential for developing people and communities. In ROMANIA, near CLUJ-NAPOCA (the second largest city in Romania) in a charming and traditional area from the centre of Transylvania (SAVADISLA, Cluj County). Suitable accommodation has been arranged at a friendly and well-equipped hotel, with traditional home-cooked meals. This area offers an authentic experience, peaceful nature and the harmonious mix of cultural differences. The program will also include a city tour to Cluj-Napoca in which our learners will visit relevant NGOs and programs. All costs are covered by the organizers Full participation during all 6 workshop days is mandatory. Good command of spoken and written English is desirable. A Certificate of participation will be provided at the end of the workshop. Complete the attached Registration_form_Grundtvig_AT_Alphabet_of_Volunteering and send it by email to training@provobis.ro by January 31st 2014. Only applications received by email will be considered. Selection will be made based on the assessment of your experience and involvement in literacy programs according to the information provided in the registration form. Selection results will be announced early February. All applicants will be informed about the selection results.